Sunday, October 27 1907 -- Abe Attell, featherweight boxing champion, is set to go into the ring against a young up and coming fighter, Freddy Weeks of Cripple Creek Colorado, on Tuesday. Apparently with only two days to go before the bout the fighters' cuts still haven't been decided on. Sunday, October 27 1907 -- It's duck season (not wabbit season) in California, and Herriman has some suggestions for the improvements that can be made hunting with those newfangled automobiles. In the accompanying article, Herriman is referred to as "the Egyptian cartoonist"! I've said it before, I'll say it again. I LOVE Herriman Saturday! Note that Attell would later be implicated in the fixing of the 1919 World Series. 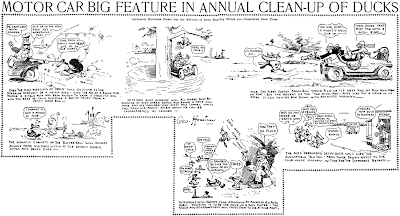 Other than Outcault's Yellow Kid and Buster Brown, there was little in the way of comic strip character-based advertising in the first decade of the twentieth century. So I was really taken aback when I chanced upon this advertisement in a June 1907 issue of the Tacoma Ledger. Gustave Verbeck produced his Terrors of the Tiny Tads strip from 1905-1914, but I never got the impression that it had the sort of popular recognition at the time that would make the characters attractive to the advertising world. Nonetheless, here we have a corset ad produced by the Tiny Tad Company that apparently got national distribution. Hello, Allan---I suppose that, if Verbeek used Outcault as his model, he also produced cuts to advertise various products. I doubt if they stopped at corsets. Outcault had Buster pushing guns, clocks, clothes, and various hardware, so watch out for other Tiny Tad ads.--Cole Johnson. So this is how comics became a vast waist land. That's the problem with the web -- no rimshots. The feature Trixy and Frisky and Flitchy is over a hundred years old, but looking at it you'd swear it was more like 150. The subject and art style just seem so mid-Victorian to me. It's all quite attractively done, mind you, but it looks like something cribbed out of an old copy of Phunny Phellow or Frank Leslie's Budget of Fun. The creator, who signed him- or herself only as Arrowhead, seems an apt moniker. As in "this stuff looks so old I bet they dug it up with some old arrowheads". The versifying, on the other hand, is truly timeless. What was the mania these early cartoonists had for poetry, anyway? Sure, I know it comes from the Victorian tradition, and that people in this period still appreciated a little iambic pentameter sprinkled about in their newspapers. But if you were so completely inept at the activity, like our pal Arrowhead here, why wouldn't you stick with prose? Why torture the poor newspaper readers of Philadelphia -- what'd they ever do to you? Anyway, no point in flogging a century-dead horse. Here are the stats. The clowns Trixy and Frisky and their lovely porcine assistant Flitchy took their first bows in the Philadelphia North American on April 15 1906 and got the hook on June 3 of that year. Artist Arrowhead wasn't heard from again -- presumably he was put back in the Indian burial mound where they found him. Cole Johnson occasionally sends me envelopes stuffed full of obscure comic strip goodies, which are always a wonderful treat -- just about the best present anyone can give to the Stripper (though a cherry 1968 Thunderbird 2-door coupe or a Wacom Cintiq 21UX pen display would also be quite welcome, thanks). But Cole doesn't just send goodies inside the envelope. Many of them are decorated on the outside with delightful cartoons -- they're eagerly anticipated by all at the Holtz household, not to mention our mailman, too. This particular one arrived a little while ago, and I just can't keep it to myself. It gave me quite the belly-laugh. Of course to get the joke you have to be pretty darn well-versed in your comic strip lore. Even my wife, comics expert by proxy, didn't get the gag. Do you? Rather than explain it, I leave it up to you folks. Who amongst you will take the challenge to explain the gag? First one to post a blog comment explaining the gag to my satisfaction earns a goodie box of comic strip stuff delivered to your door. The girl is Dorothy Darnit, drawn by George McManus' brother Charles McManus, correct? And the style is done in Prince Valiant/Hal Foster mode....don't know if the ax is supposed to represent something...I'm supposing Hal Foster had a brother named Charles Foster who was also a cartoonist/illustrator? 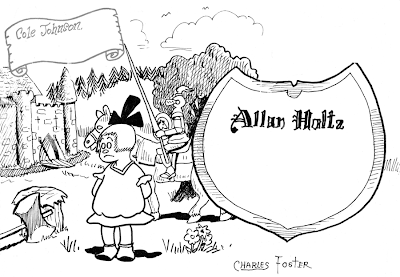 It looks like the gag is just a combination of Charles McManus and Hal Foster, or; If a great cartoonist (like Hal Foster or George McManus) had a brother (always named Charles) he would always choose something like Dorothy as his subject, while being influenced by his brother's subject at the same time, hence, the medieval motif in the background. RTususian, I really want to give you the nod but you went too far in thinking that Hal Foster really had a brother Charles. As Grizedo says, that's the gag -- it's a 'what if' scenario -- what if Hal Foster had a brother who was as untalented as George McManus' brother Charles. Well, naturally he'd draw Dorothy Darnit in a medieval setting. So I gotta crown Grizedo our comic strip PhD today. Congrats Grizedo, and send me your mailing address so that you can get your box of goodies. "Ed." Wheelan, who is in his early thirties, is one of George Matthew Adams' stand-bys and daddy of "Minute-Movies" which enjoys a remarkable vogue. Wheelan is a Californian by birth, but migrated to Brooklyn, N. Y., and secured a contract with Brooklyn Daily Standard-Union to draw sport cartoons, and, as the saying goes, made quite a hit. Hearst drafted him over to the New York American to do sports. A two-column series called "Mid-Summer Dreams" was published by the New York World, and we all wish "Ed." would resurrect "Old Man Experience." Wheelan and Albert Payson Terhune were neighbors for quite a while and both were attracted to each other by their mutual love of dogs. "Bugs" Baer worked in the Standard-Union with Wheelan, and likewise jumped to the New York American. Zere, of the Brooklyn Daily Eagle and the New York Post, is another Brooklyn cartoonist who has made good with a bang!! "Sid" Smith, originator of the Gumps, will illustrate the comic section of the Purdue University year-book this year. Walter R. Bradford, of Philadelphia, "cartooner" of The North American for twenty years, died a few days after that newspaper suspended publication. He was familiarly known as "Brad." Mr. Bradford was the creator of Enoch Pickleweight, the archtype of the henpecked husband; of Scow, the club-tailed cat; of John Dubbalong, the inventor whose name indicated his fumbling abilities, and of Jingling Johnson, the poet, whose ink-drawn outlines were a cartoon of Brad himself. There were other characters in his back-page strip that was a feature in The North American during two decades. When the newspaper was purchased recently by Cyrus H. K. Curtis and its publication was discontinued, Bradford was its radio editor. He was as picturesque in Chat role as he had been in many others since he came out of a South Bend machine shop to be what he always called a "cartooner." That was his own name for his kind of job. For months Bradford had been fighting against tuberculosis, putting up a fight that aroused the admiration of his associates on The North American. The closing down of that newspaper was a great blow to him, as his littered desk on the eighteenth floor had been as much a playground as a workshop. "Almost immediately," Mrs. Bradford explained, "he went to White Haven, but he would not stay there and came home a few days later." Bradford was fifty-three. His home was at 5551 Delancey Street, Philadelphia. He is survived by his widow, who was a native of England, and a son, William Bradford. Bradford was born at Dayton, Ohio, and as a young man worked in the Studebaker carriage works at South Bend, Ind. He had a bent for drawing and started to attend night classes at Frank Holmes' school in Chicago, where he met John T. McCutcheon and other famous cartoonists, who encouraged him. He worked on the Chicago Tribune, then on The North American, and shifted to the Baltimore Herald. When the Baltimore fire put him out of a job he returned to Chicago to work for the Journal. Then he went back to The North American for his last job. "He loved his work there," Mrs. Bradford said. "He loved the characters he created and had fun out of them, Enoch, Maria, Dill and Pa Pickleweight — Ichabod, the old Injun fighter. The Scow cat was his mascot when he built his motorboat in our back yard in West Philadelphia about fifteen years ago and named it the Dubbalong. "He and Hugh Sutherland collaborated in his strip-comics over many years." Bradford was protean with his hobbies. They included fishing, amateur photography and radio. In recent years he had written for a radio magazine, creating a new character, "Enoch, the Radio Doodlebug." Bernard Partridge, regarded by many admirers as the greatest cartoonist in the world, has been knighted by King George V. His name was included in a list of 600 persons honored on the British monarch's birthday. Mr. Partridge, as cartoonist for Punch, enjoys well-deserved popularity. He has that rare combination of powerful ideas and faultless technique. Nearly all of his work is done with pen and ink. His cartoons on the World War— especially his clever satirical attacks on the former Kaiser—were reproduced in newspapers and magazines all over the world, and contributed substantially to the overthrow of William Hohenzollern. A noteworthy fact about Mr. Partridge's cartoons is that they are both dignified and forceful—there is very little caricature in them—so different from the grossly distorted cartoons of Germany, Italy, Spain and other foreign countries. I came across a grouping of Cartoon pictures a little bigger than 9" x 11". The all depict scottish cavemen type characters playing golf in what I presume is prehistoric times as every drawing has a dinosaur of some type coming after the golfers. They are all dated 1925 and are all signed by what looks like Walter Rouff? Do you have any more information you could share on the cartoonist? Bud now and then takes some of his vast earnings and makes an excursion into business. Recently he decided to back a tailor in a rather gaudy little salon on Madison Avenue, New York. It was opened with a flourish. Bud ordered the first suit. He received it in a week. The next week the shop blew up in bankruptcy, and all Fisher has retrieved out of the wreckage is that single suit of clothes, which he values very highly. There is one cartoonist in this country who did not draw a commencement day cartoon for June, but we do not know who he is. Would some reader be kind enough to enlighten us? And somewhere there may be a comic artist who is not planning a funny strip on the subject of vacation, but we doubt it. We thought we had discovered a pen-and-ink slinger for the Hall of Fame. He did not produce a "welcome-to-Spring" picture this year. Investigation revealed, however, that the near-hero died during the winter. We strongly suspected this, our only other guess being that his lusty right arm was paralyzed. Sidney Smith, creator of "The Gumps," a widely known comic strip, is mourning the loss of his wife, who died recently at their home at Lake Geneva, Wis. Shortly after her death a statue of Andy Gump was unveiled on the front steps of the Douglas County Courthouse, Omaha. Mr. Smith did not attend the unveiling, but a few days later he went to Omaha to address the Ad-Sell League. 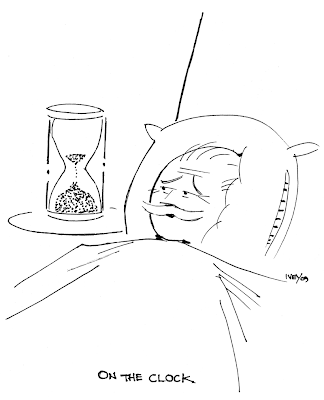 Jay Norwood Darling (Ding), the Des Moines cartoonist who has been ill for many weeks in a hospital, continues to improve, according to latest reports. He is now able to sit up several hours a day, and enjoys listening in on the radio installed in his room. He hears the stations broadcast bulletins about his own health, in addition to regular programs. John Held, Jr., known as the creator of "O! Margy" (United Features Syndicate, of New York) is spending the summer touring the Mediterranean. Latest reports had him visiting Gibraltar and Morocco. 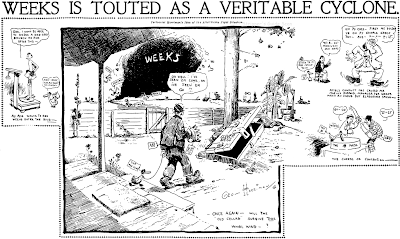 Comic-strip fans welcome the appearance of three new gems: "Ella Cinders," by Bill Conselman; "Good Scout Tommy," by Edward McCullough, and "Scoop, the Cub Reporter" (revived) by Frank Hopkins, of Camden, S. C.
The three are handled respectively by the Metropolitan Newspaper Service, New York, the New York World Syndicate and the New York Herald-Tribune Syndicate. "Ella Cinders derives her name from and is based on Cinderella," Max Elser, Jr., president of Metropolitan explained. "The Cinderella motif is generally accepted in fiction, in the movies and in the legitimate drama as the most popular of all themes. "This new strip of the Metropolitan was planned last summer, by its originator, Conselman, formerly of the editorial staff of the Los Angeles Times. The drawing is the work of Charlie Plumb, who was formerly on the Los Angeles Times. The introductory strips were drawn last year." McCullough is also creator of "Embarrassing Moments" for the Chicago Tribune Newspapers Syndicate, and produces a weekly comic strip called "Folks in Our Town" for the Publishers Autocaster Service, Inc.
What is the scop about this Cartoons & Movies magazine you have been quoting from lately? Is it a short lived magazine of the mid-20s? I never heard of it before. Care to describe what it is like -- format, content, mix of movie and cartoon news (does it also cover animation or justlive action?). Cartoons & Movies was the revivified version of the old Cartoons Magazine. 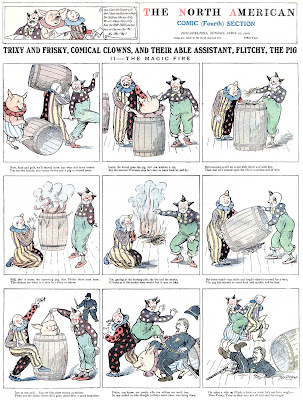 The original Cartoons was rejiggered as a western pulp mag in mid-1921 called Wayside Tales. That title apparently didn't do well, and at the end of 1923 they resurrected Cartoons. The new version was not at all like the original --gone were most of the editorial cartoons, replaced by gag cartoons, many by amateurs (or amateurish anyway) and photos of starlets in various stages of undress. The mag was much smaller, about 68 pages rather than several hundred. And if you think Cartoons magazines are hard to come by, they're downright plentiful compared to Cartoons & Movies. Ah, a new Jim Ivey piece. Love it! Thanks to you both!